Candela Corporation scored big when it brought the GentleLASE Plus 755 nm Alexandrite Laser to market. The GentleLASE Plus became an instant leader among cosmetic laser devices designed to reduce or remove hair from the entire body, save for the vicinity of the eyes. The device is suited to treat skin types one through four, and produces outstanding results on light skin. The GentleLASE Plus can quickly and painlessly eliminate any size patch of hair. 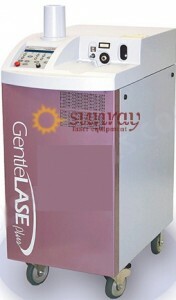 SunrayLaser.com’s refurbished GentleLASE Plus relies upon the non-invasive alexandrite laser technology cleared for hair removal by the U.S. Food and Drug Administration in 1997. The same methodology that has recently attracted attention for tattoo removal. The GentleLASE Plus system features Candela’s patented Dynamic Cooling Device. To maximize patient comfort, the DCD precisely coordinates a blast of cold cryogen with the laser pulse. SunrayLaser.com is pleased to carry quality equipment from Candela. Practitioners around the world praise the GentleLASE Plus. We thoroughly recondition each unit to ensure that it performs to original specifications and standards for safe operation. We aim for total client satisfaction; as a result, SunrayLaser has developed loyal customers for refurbished medical lasers. To discuss how a GentleLASE Plus can enhance your practice, please use the form below to tell us how to reach you. A knowledgeable representative will contact you quickly. We love to talk shop!